It should go without saying that domestic violence is a serious matter. According to the National Coalition Against Domestic Violence nearly 20 people per minute are physically abused by an intimate partner in the United States, which equates to more than 10 million women and men during one year. On a typical day there are more than 20,000 phone calls placed to domestic violence hotlines nationwide. And among so many other disturbing stats is this one... the precense of a gun in a domestic violence situation increases the risk of homicide by 500%. At about 10:00pm, the night of October 31st, 2015, police were called to the home of Aroldis Chapman. When they arrived Cristina Barnea met them in the driveway, and informed them that her and her boyfriend (Chapman) got into an argument. During the argument Chapman had allegedly pushed her before the argument was broken up by family members. At which point Barnea ran outside, heard "shotgun" blasts, hid in the bushes outside the home, and called the police. It was also advised that her infant child was still inside the residence with Chapman. After checking guests as they left the house and finding nothing on them, police established a perimeter around the home until Chapman finally exited the house without incident. It was established at the time that the argument between Barnea and Chapman started because Barnea found something in Chapman's phone that she did not like. Ms. Barnea then went into the bathroom with the phone, while Chapman followed her in there and took the phone back. Barnea then wanted to speak with Chapman in the home's movie theater, which is where she claimed to have been pushed by Chapman. That is when Barnea's brother broke things up, leading to her running outside and hiding. Barnea's brother also spoke with an officer, saying he did attempt to stop the argument between his sister and Chapman. He did note that while there was arguing happening, he saw no physical violence occur. Chapman's employed driver also gave a statement, most of which included the same facts listed above. One big difference is that Barnea apparently charged at and tackled Chapman in the theater (which Barnea says did not happen). However, the driver refused to provide a sworn tape recorded statement. In the report Chapman corroborated the events of that evening, however he had simply used his index and middle finger to push Ms. Barnea on the left shoulder to move her away from him while saying she should not talk to him that way. At that point Barnea fell to the ground and started yelling, prompting her brother to run in, push Chapman to the ground, and along with friends and relatives break up the altercation. Chapman left the house at that time, and wanted to drive away, but friends did not let him do that. Instead he and a friend sat in Chapman's Land Rover, where he punched the window and lacerated his hand before exiting with a pistol he got out of the glove compartment, and went into the garage. While in the garage he fired the gun "several" times before throwing the gun away. At that point friends took him into his room and locked themselves in. It should be noted that Chapman, like his driver, refused to give a sworn recorded statement or sign an affidavit of complaint. He did, however, sign a consent to search around the exterior of his garage. Barnea then said she did not want any further involvement with the incident, and just wanted to collect her belongings and leave. At that point she was allowed to do so, and was advised to call the Davie Police to stand by while she later collecting any other belongings from the home. Barnea then left without further incident. Finally, officers could not find the gun outside the garage, and were advised that this was because Chapman had actually retrieved the weapon and put it in his Escalade so that nobody else could find it and hurt themselves. Chapman was told doing so hindered the investigation, however it was found that that wasn't his intention and no charges were filed. In the end it was noted that due to several inconsistencies in Barnea's statement, as well as the statements of others changing several times during the investigation, the case would be forwarded to the State Attorney's Office for review. While the police report pointed out inconsistencies, I wanted to talk about some of them myself. The first of those has to do with the number of people that apparently saw the incident. Cristina Barnea, herself, noted that the incident happened in front of "everyone". The police report also noted that there were around 20 guests at the party. However, not one of them corroborated the story that Ms. Barnea gave, nor have they come forward afterward to say Mr. Chapman did anything such as choking her or endangering her or anybody else. Now, I understand that some people may not wish to testify against a celebrity such as Chapman. Doing so can create all sorts of problems for a person, among those things are unwanted attention from the media, negative comments and attention on social media, and possible unwanted legal battles from said celebrity. However, especially at a time where so many things can be said anonymously while speaking to a journalist "off the record", or on any number of message boards and such on the internet, you would think something incriminating would have been said about Aroldis Chapman. Yet there's been nothing. Then you have what may be one of the most disturbing things to be noted during the police investigation that night... allegations of choking. Honestly, that part seems to be total crap. For starters, Barnea noted in the police report that even though Chapman was "choking" her, she was never unable to breathe. Look, the very definition of choking is to prevent airflow into the lungs. Ms. Barnea clearly used the word "choke" in order to make things sound much worse than they actually were. If anything, Chapman at one point may have touched her throat, but no actual choking actually occurred. Later on, in a sworn waiver of prosecution to the State Attorney's Office, Ms. Barnea changed her story saying Chapman only "used his fingers to move her away from him, and out of his personal space. She lost her balance and fell to the ground." Need I say more about this part of the incident? 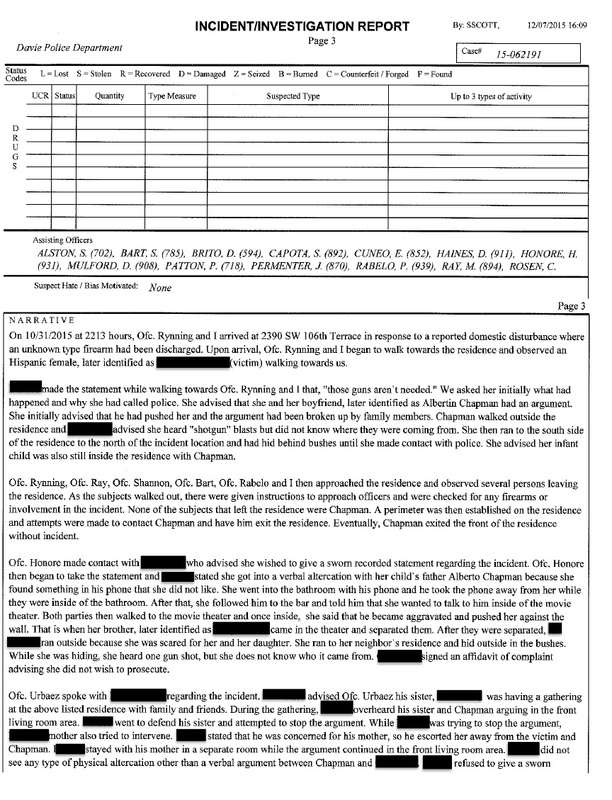 Another reason a lot of people are upset about what allegedly happened between Barnea and Chapman is that it happened in front of their infant child. I want to note that this is absolutely not true. The fact is the child was being cared for by Barnea's mother, out of view of the party and the incident. Nothing of the sort was mentioned in the police report, neither. This is just another attempt at people trying to build up the story into more than it actually is. I also want to say that there is zero evidence that Aroldis fired his gun outside of his home, nor in the direction of anybody. The first part is very important as firing a weapon outside of private property is against Florida law. Furthermore, Aroldis agreed to a search of the exterior of the garage, which tells me he was not trying to hide anything he had done. While he was told he was wrong in removing the gun from the garage, as doing so interfered with a police investigation, Chapman never attempted to hide the fact surrounding his use of the gun from anybody. If any sort of wrong-doing happened during the incident, such as him threatening Barnea or anybody else with the weapon, don't you think that would have been mentioned in the police report? Or don't you think that such a thing would have been brought up during the investigation by the State Attorney? Or like I mentioned earlier, don't you think somebody that was at the party would have said something about gun violence? I want to point out that Ms. Barnea is not so innocent, either. Look at the following report of her breaking into Chapman's home while he was getting ready to return to Florida after the Reds' season had ended the day before in Pittsburgh. 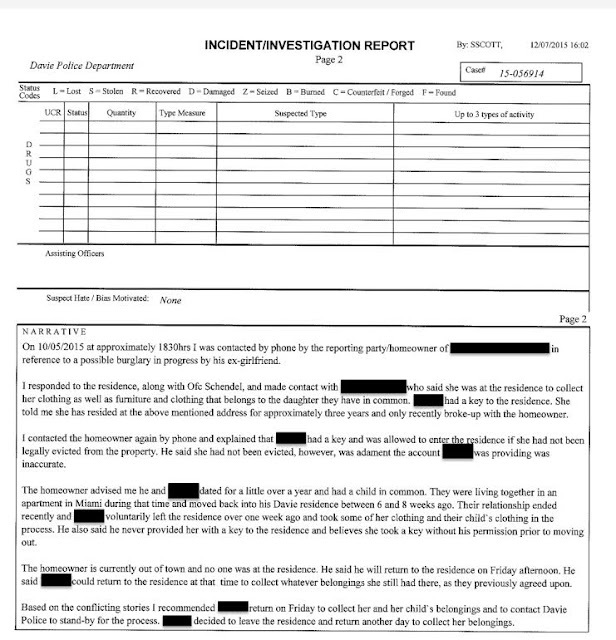 As I did with the other police report, let me break it down. Ms. Barnea had returned to the house after their relationship ended (which included Barnea voluntarily leaving the house, and using a key she had taken without Chapman's knowledge) and entered the home. And although that is not a completely legal or even morally correct thing to do, Chapman still agreed to allow Barnea to collect her's and their child's things from his house. The final nail in the coffin of Aroldis Chapman being guilty is this.... they are still together nearly a year and a half later. We're not talking about the guy having a one-night stand with somebody, and that somebody is keeping their mouth shut about a celebrity they slept with. This is clearly a committed relationship. Cristina Barnea was even Chapman's special guest at the World Series this past season. 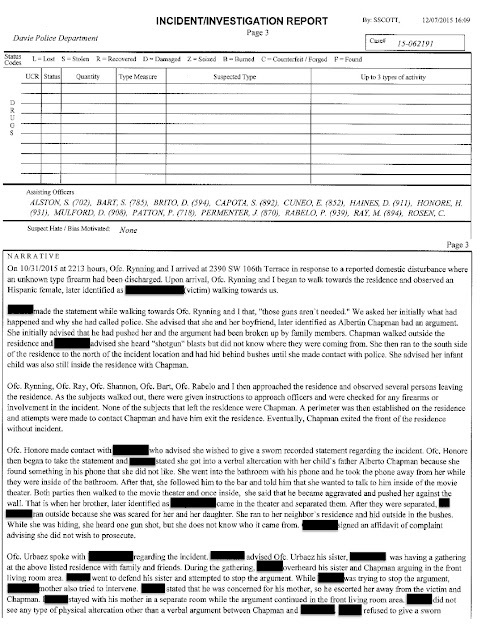 All of the following information tells me that Chapman and Barnea simply got into an argument the night of the party, and it's highly likely that alcohol helped to escalate a simple argument into an "incident". Things were said and accusations of cheating were made. In response Aroldis got mad, went to his car to talk it out with a friend, wrongly (note the bold font and italics) decided to take his gun from the glove compartment and into his garage, and vented by firing that gun eight times into the wall (accidentally firing one through the window and into an open field). This is not a case of a horrible man doing horrible things. In fact, I believe that if there was no gun involved, there's a good chance this whole thing would have faded away in a heartbeat. But due to the issues of domestic and gun violence being as big as they are (and for good reason, mind you), along with it involving a high profile celebrity/athlete, the story was jumped on by all sorts of people (media and others) and blown up into something much bigger than it was. Look at it this way... Aroldis was not arrested and charged with abuse against his wife that needed medical attention, yet Jose Reyes... who is guilty of those things... received a hero's welcome at Citi Field when he returned following his suspension. Aroldis Chapman was not videotaped punching his wife in a casino elevator, but there are people... even women... who supported Ray Rice after he did just that. Chapman was not accused of trying to kill his own mother, but Dez Bryant's mother forgave and supported him for doing that. 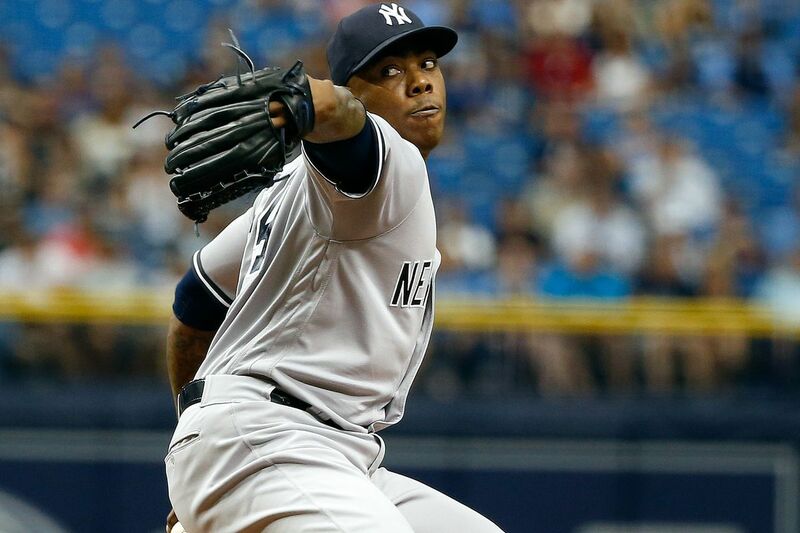 If you think I'm not going to root for Aroldis Chapman when he steps on the mound for the Yankees then you're out of your mind. Domestic violence, whether it's a simple misunderstanding or an incredibly violent act caught on camera, is not acceptable. But to treat Chapman like he's some type of monster that doesn't deserve a chance to redeem himself is downright wrong. I will accept your right to act as you wish towards the man, but don't think for one second that I'm going to agree with it. Actually, if anything, I'll cheer louder to drown out your booing. I thought we were past this incident. Why the need to repost in April 2017. C'mon I too root for Chapman but enuf with rehashing the past. just saying! We came across some new information, like the actual police reports and such, and we wanted to bring it up again. We wanted everyone to have the whole truth. Nothing wrong with that.